It’s taken me a bit too long to catch onto this, but there has been a veritable social media frenzy going on recently that dwarfs even gossip about failing censuses or the latest from The Donald. 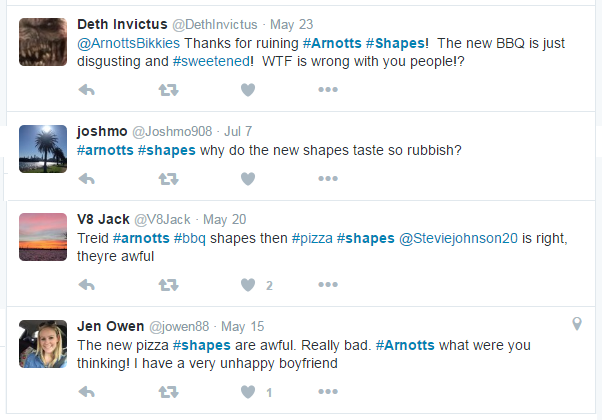 Yes, it’s the reaction to Arnott’s ‘New and Improved’ Shapes. Shapes are, of course, a range of savoury snack biscuits that boast the unusual feature of having ‘flavour you can see’. Except that, in the new version, apparently you can’t. Arnott’s have launched a whole new range, including new and improved version of some of the classic flavours. However, I guess to hedge their bets, they are also still making the original version of two types – BBQ and Chicken Crimpy. So, when I saw both the original and new on sale at the supermarket, I bought a packet of each to do the definitive taste test. But before we get to the comparison, let’s take a look at a few choice comments on Arnott’s facebook page. So what prompted Arnott’s to change this iconic snack – which has been in production for over 50 years? 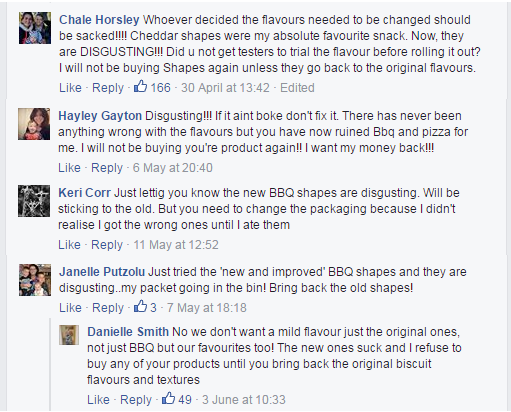 Well, apparently people were complaining that they wanted more flavour on their Shapes, and that the flavour wouldn’t stay stuck to the biscuit. Pesky stuff that visible flavour. I must admit, reasonably tuned into to the biscuit world as I am, this was not an issue I was aware off. Indeed, for many people having the flavour fall off is kind of the point, as it means the last biscuits in the pack accumulate the flavour that has dropped of the ones above. And then, at the end of the pack you get the pleasure of running a finger inside the pack to collect the dregs of flavour that remain. The whole thing could have been designed to deliver a gradually-increasing dose of Flavour You Can See, culminating in that last, luscious hit of salt and monosodium glutamate. But apparently this way of enjoying Shapes was passé, and a redesign to get more flavour, more consistently on each biscuit was required. This redesign was about more than just the flavour adherence mechanic, however. It was also about the flavour itself. Changes to the recipe were made, which somehow also yields the New And Improved versions an extra health star. Looking at the nutrition panels on each box, it seems pretty much everything is the same, except the new ones have less salt and more sugar. Anyway, enough of all that. How to they compare? Well, you can read about the original ones here, as I looked at them some time ago. Compared to the originals, the new ones have a slightly lighter, more open texture, which actually I quite liked. However, things are not so happy in the flavour department. The new ones are clearly much sweeter (that extra sugar), and amazingly even more artificial tasting. Besting the originals on artificial-ness was a big ask, but the Arnott’s team have managed it. Overall, the new flavour is not very nice. Too sweet, to cloying. It’s hard to eat a whole box of these in one go; they get sickly. The originals, by contrast, are highly addictive and are gone in a flash. Having drawn my own conclusions, I put out the two types in different bowls next to each other in the office. The Original flavour bowl was empty in about 10 minutes; an hour later there were still some left in the ‘New And Improved’ bowl. So clearly my co-workers agree with my assessment. So will Arnott’s relent? Will they retire the New And Improved, and quietly revert to the originals? 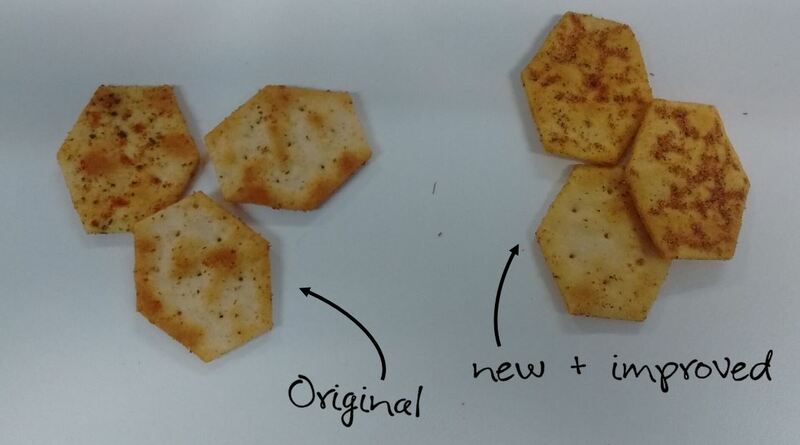 In the meantime, I’m going to give these New And Improved BBQ Shapes a 2 out of 10. I must agree with your assessment and the social media hype These “new and improved” versions are rubbish. 2/10 is generous in my opinion.